The Cheltenham Festival has a way of creating stories and Rock The World's success in the concluding race of the 2017 Festival, the Johnny Henderson Grand Annual Challenge Cup Handicap Chase, provided a fitting final chapter for two of the leading's lights of this year's Festival, trainer Jessica Harrington and jockey Robbie Power. Third in the contest last year, the nine-year-old son of Orpen produced a superb leap at the final fence under Power before gamely fending off his rivals by a length and three-quarters. Venetia Williams' Gardefortvwas second, with Dandrige, trained by Arthur Moore, two and a half-lengths further back in third. The victory capped a memorable week at Prestbury Park for Harrington and Power who also claimed the spoils in the Timico Cheltenham Gold Cup, courtesy of Sizing John's superb performance in the extended three and a quarter-mile event as well as Supasundae's victory in the Coral Cup. 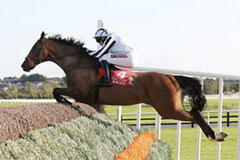 A delighted Harrington said: "What a day! He was third in this race last year, he had a wind operation earlier this season and I couldn't run him at home as the ground was too heavy so we gave him a couple of racecourse gallops. Unlike last year where he just plodded on, this year he could breathe. "He loves quick ground and is a beautiful jumper. He absolutely pinged the last and didn't stop all the way up the hill. It's fantastic for Robbie as well." Venetia Williams, trainer of the second-placed horse, Gardefort, said: "We're really thrilled with him; he's run a superb race. It's very hard to win any of these races here, but to have him finish second and I think Calipto finished in the prize money as well [sixth], is great." The Cheltenham Festival 2017 became a year to remember for jockey Robbie Power and trainer Jessica Harrington. The pair won the last race of the meeting with the 10-1 chance Rock The World, the success adding to their wonderful Timico Gold Cup victory with Sizing John and Supasundae's Coral Cup win on Wednesday. "We knew we had our best team coming here, it's wonderful that it's all worked out," said Power. "Full marks to Jessie - this horse ran terribly here in October, but he had a wind operation since and this was his first run back. It is some training performance by Jessie. "His wind caught him out in this race last year on ground with a little more give. "At one point today, he took a breath, but when he realised he could breath, he ran on. "He is a wonderful jumper, Jessie always schools them a lot, and he was foot perfect here. "I had one winner in 2011, and it is has been six dry years since then. To take home three this year, including the Gold Cup, is unbelievable."